Protesters hold placards near the Myanmar embassy in Kuala Lumpur, Malaysia August 30, 2017. It is no surprise that Rohingyas in Malaysia feel helpless and frustrated at the events unfolding in Myanmar. 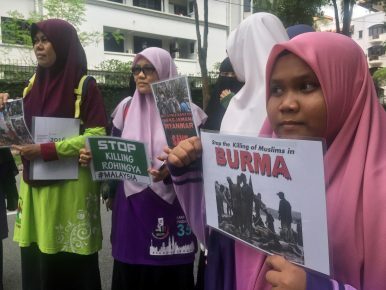 On August 30, 2017 a group of ethnic Rohingya protesters descended on the Myanmar embassy in Kuala Lumpur to deliver a memorandum protesting the recent spike in violence in the Rakhine state by Myanmar’s forces. Since August 25, official data from the Myanmar government put the number of those killed in Rakhine state at 100. The uptick in violence has driven thousands of Rohingyas into Bangladesh where there have been reports of border guards turning them away, leaving them to face certain death. In Kuala Lumpur, around 1,000 Rohingyas from all over Malaysia protested the violence at home resulting in slightly chaotic scenes when the group marched towards a busy intersection in the city center and ignored calls by the police to disperse. Forty-four protesters were arrested and the crowd eventually dispersed at 12:30 p.m. Section 4(2)(a) of Malaysia’s Peaceful Assembly Act 2012 makes it an offence for a non-citizen to assemble, even peaceably and without arms. Peddling the narrative of the ever-grateful and subservient immigrant, a number of Malaysians today are asking: How can these Rohingyas be so ungrateful when we have given them shelter in Malaysia? For many, fortunes in Malaysia are only marginally better and many have left behind family in Rakhine state. 18-year-old Mouyura Begum was detained at the Belantik Immigration Depot in Malaysia’s northern state of Kedah for more than a year. Describing conditions at the immigration facility to The Guardian, she said that meals were only accompanied with a small cup of water, forcing detainees to drink toilet water to quench their thirst. The Guardian reported her saying: “Only when someone was about to die would the guards come. Otherwise, if we complained, or if we asked to go to the hospital, they beat us”. Mouyura’s experience corresponds with news reports on Malaysia’s immigration detention centers – the first stop for all asylum seekers in Malaysia. According to UNHCR data, there are some 132,500 refugees from Myanmar in Malaysia, of which 59,100 are Rohingyas. Earlier in the year, the Ministry of Home Affairs revealed that 161 detainees died of various diseases in immigration detention centers from 2014-2016. While the ministry made no mention of how many of the dead were Rohingya, half the number hailed from Myanmar. The government neither restricts nor facilitates access to the UNHCR compound but many asylum seekers find being released from immigration detention an almost insurmountable obstacle in itself. The UNHCR in Malaysia operates from a compound that is completely inaccessible by public transport, making it all the more difficult for asylum seekers to make the journey there. To halt the influx of Rohingyas, Malaysia’s government has long been reluctant to accord asylum seekers the right to work, and their children access to national schools. On March 1, however, Deputy Prime Minister Ahmad Zahid Hamidi announced a pilot scheme that would allow Rohingyas to work provided that they were UNHCR cardholders and passed health screenings. To date however, only 40 have signed up for the scheme, many either already employed illegally or not registered with the UNHCR. In January 2017, the Organization of Islamic Cooperation (OIC) convened an Emergency Ministerial Meeting in Kuala Lumpur to discuss the situation of Rohingya Muslims in Myanmar. The meeting, called at the behest of Prime Minister Najib Razak, adopted a communiqué rebuking the government of Myanmar and calling upon it to “abide by its obligations under international law” and take necessary measures to stop the violence and discrimination against the Rohingyas. The meeting heard from Prime Minister Najib Raza, who said “The killing must stop. The violation of women and girls must stop. The persecution of your fellow men and women, simply on the grounds that they are Muslim, must stop.” In light of his government’s treatment of Rohingya asylum seekers in Malaysia, many commentators have dismissed Prime Minister Najib Razak’s comments as political theater, intended to gain support from his party’s conservative base ahead of the forthcoming general elections. In 2015, police uncovered 139 graves and rescued 28 persons abandoned by a human trafficking ring targeting Rohingyas and Bangladeshis along the Malaysia-Thailand border. Twelve Royal Malaysia Police officers were arrested for possible collusion with the trafficking ring, but in March 2017 in response to a parliamentary question, Deputy Prime Minister Ahmad Zahid Hamidi stated that all 12 were released due to a lack of evidence. Thailand on the other hand, has handed down severe sentences to an army general, two provincial politicians, and 59 others, in the same case. If Prime Minister Najib Razak intends to successfully pressure Myanmar to improve its treatment of the Rohingya minority, he should first introduce tighter border measures to reduce incidences of human trafficking, improve conditions at immigration detention centers, afford asylum seekers basic rights to work and education, and work with the UNHCR to facilitate access to its office. Until then, it is no wonder that Rohingyas in Malaysia feel helpless and frustrated at the unfolding of events in Myanmar.